The Patriots welcome the Miami Dolphins to Gillette Stadium for their Week 15 matchup. Follow along here for live updates of the game, including commentary and analysis from Boston and Foxborough. Gronk, Brady, Edelman should be out of this game with 7:00 minutes left with the outcome not in any doubt. Gostkowski nails the 36-yard FG attempt, makes it 41-13 Patriots with 6:20 remaining. The #Patriots have now scored 40+ points in 5 games this year, tying the franchise record set in 2012. Get the Caps and T-Shirts ready! Wow, #Bills defense is for real. Not terribly surprised to be honest. #Packers offensive line has been shaky, BUF DL has been dominant. Rob Ninkovich wishes he could regenerate. Ryan Tannehill may need to regenerate after Ninkovich's sack. SACKED! Chandler Jones & Dont'a Hightower drop Tannehill for an 11-yard, 4th-down sack to give the Pats the ball back. 11-yard sack on 4th down. Fitting end for the Patriots defense that has been lights out the second half. Jimmy Garoppolo is in the game. Patriots have emptied the bench. Jimmy G, Tyms, Amendola, Develin all in for the start of this series. RT @flasportsbuzz : Fitting that Dolphins' 1st and goal ends on Pats 34. 34! Nice win Pats. Love those halftime adjustments. Patriots beat Miami 41-13, win the AFC East for the sixth straight season. There will be at least one playoff game at Gillette Stadium. 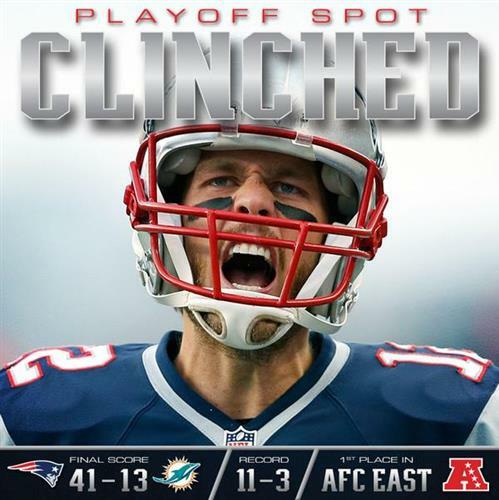 FINAL: Patriots roll the Dolphins 41-13 to clinch their sixth straight AFC East title. Improve to 11-3 on the season. For the 6th straight year the Patriots are your AFC East Champions – becoming just the 4th team in @NFL history to win at least 6 straight. BB on Chandler Jones returning: good to have him back...this week about to play a lot of reps (in practice). 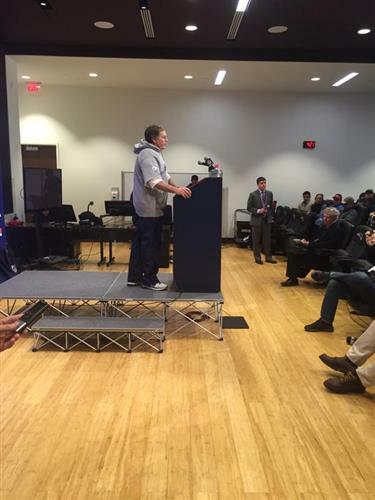 Belichick: "It was good to have (Chandler Jones) back. Looked like he was ready to go from a practice (and) conditioning standpoint."